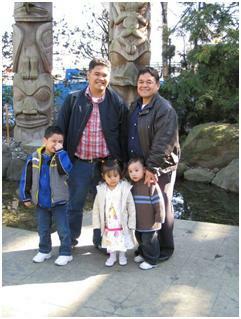 I left Manila last March 30th via a Philippine Airlines flight going to Vancouver, BC. Since my family got a pass to be able to go inside the airport they accompanied me from check-in until I got safely inside the boarding area. "This is it!" this is what I said to myself while waiting for the boarding call with me being finally excited about this trip and of course being able to go out of the country for the first time and the best part is I'll be independent. Flight got delayed for at least thirty minutes because of the two passengers who suddenly decided that they will not be taking the flight and at around 5:15, the plane took off. Moving forward, the plane arrived at the Vancouver International Airport (YVR). When I got off the plane, I have to pinch and even slap myself to convince me that what I'm experiencing is not a dream. Because it is a Sunday, it is a busy day for the airport because people who choose to fly from the United States are coming in along with those people coming from other cities abroad. I had to wait for almost an hour to be cleared through immigration and customs and another thirty to forty-five minutes to get my baggage and do further customs clearance. After that I got to the arrivals area and saw my relatives and we got out of the airport. At first I resisted wearing a jacket because I want to experience firsthand the cold weather but it is too cold, so I just wore the one that is brought to the airport by my uncle and cousins. The first thing we did is of course to take pictures, the one I posted in here is a picture with Uncle Johnny, Robin, Lana and Isaac. The first thing that I loved about Vancouver is that it is so clean. The air is clean, the roads are clean everything is clean. I also think that those who planned the city (which I will call the forefathers of the City) have planned it well. Anywhere you look you will see something that is picturesque like the snow capped mountains in spring. Mountains are always the backdrop of the city. Moving on, we arrived at this nice and cozy Collingwood neighborhood where my relatives live. We ate, and then I made my first video call to the Philippines to let them know that I arrived in one piece. After that I decided to get some rest as I haven't got enough sleep in the plane. 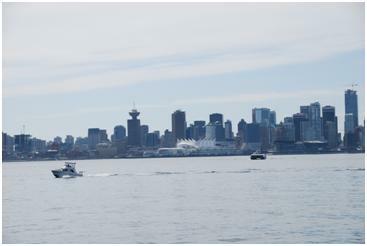 I woke up and later that night, ate dinner and we went for a drive-by to downtown Vancouver. It is so nice and the city has several landmarks such as the Telus World of Science (Science World), Vancouver Lookout at Harbor Centre and so on which I will be blogging in the next couple of days.